With the largest selection of restaurants, Grubhub delivers your favorite foods to your door. 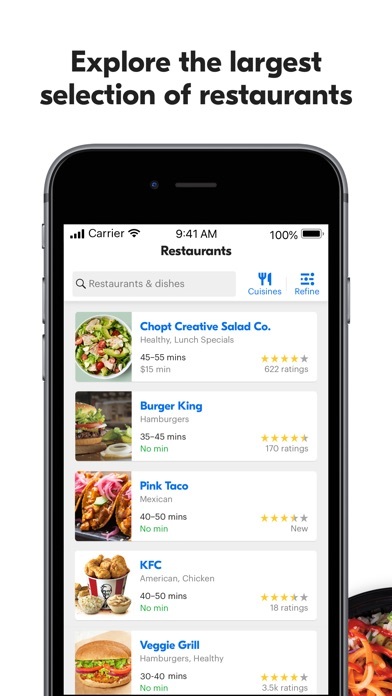 Order with a few simple taps in the iOS Grubhub app and get the restaurants you love, delivered. Feel like getting out for a bit? Great! We also offer pickup for takeout orders. Whether it’s your favorite local spot, a restaurant with a little more fame, or a new place to try while traveling, Grubhub’s got the eats you’re looking for. Wondering what your next meal could be? Each Grubhub city has different restaurants that you know and love. Arby’s, Buffalo Wild Wings, Cinnabon, Denny’s, KFC, Pizza Hut, Potbelly, Taco Bell and more are just a tap away. Here’s a little taste of the foods, local flavors, and cuisines you should be excited about: burgers, donuts, pizza, sushi, pho, wings, Italian, Korean, Vietnamese, Chinese, Greek, vegan, vegetarian and more! Order takeout or delivery and get exclusive Grubhub deals. Download today! What Grubhub offers: THE MOST RESTAURANTS - Grubhub offers the largest selection of restaurants in the nation! - Whether it’s Chinese, Greek, Italian, or any other food type you’re craving, it’s covered. - With exclusive local restaurant partners like Taco Bell, you’ll find that mom and pop shop AND the national spot you love. 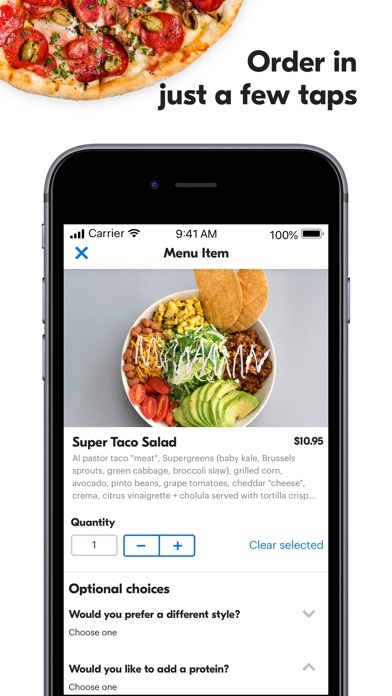 EASY TAKEOUT ORDERS - When you order using the iOS app, you'll avoid the hassle of over-the-phone mistakes. - You can also count on Grubhub’s 24/7 customer support. NO HIDDEN FEES - What you see is what you get - we promise upfront pricing with no hidden fees. - Pay through a variety of options including Apple Pay, Venmo and Grubhub gift cards. REAL-TIME ORDER TRACKING - Grubhub offers real-time order tracking so you know exactly when to dash to the door for your delicious meal. 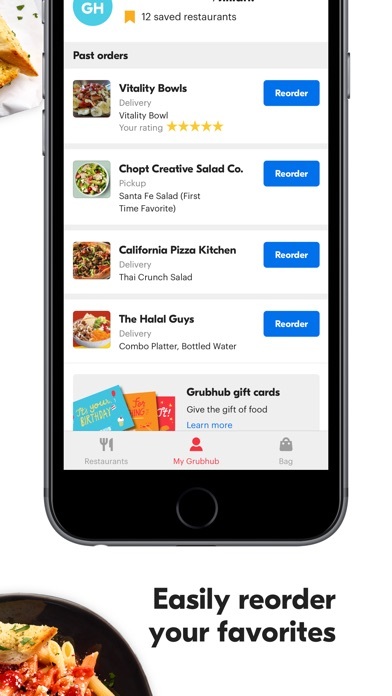 MULTIPLE ORDERING OPTIONS - The Grubhub app provides lots of great features. - Order now or preorder your next meal. - Re-order your favorite meals with a tap. - Order takeout and pick up your meal to save time and money. 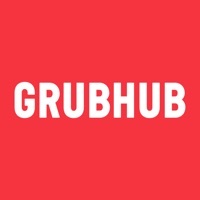 DEALS AND SPECIALS - Gain access to exclusive deals only available through Grubhub delivery service. - For a limited time, get your Taco Bell favorites delivered free with orders of $12+! (Terms apply.) QUALITY RATINGS AND REVIEWS - Grubhub has lots and lots of restaurant ratings and reviews, so you can count on getting the best food in your area. - Review the restaurants and menus you try to help other Grubhub customers. Order the eats you love from local restaurants near you. Download Grubhub now! 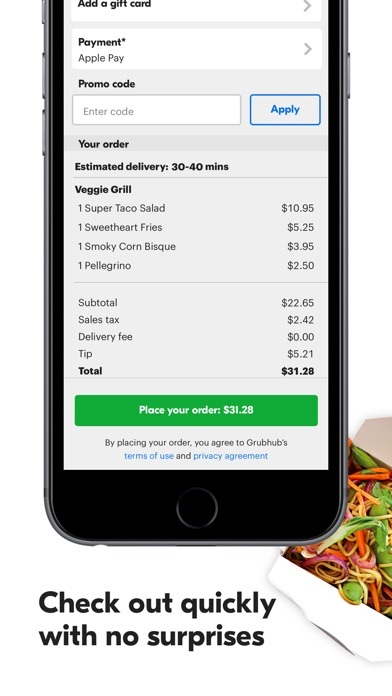 Ready to start ordering with Grubhub? Great! Here’s what to do next: • Download the app • Sign in or set up your account (you can even use Facebook) • Choose from your favorite restaurants or try something new • Pick your perfect meal We suggest you post up with your mates and order your next food delivery in some of these Grubhub cities: Albany, Atlanta, Austin, Baltimore, Boston, Bridgeport, Chicago, Dallas, Denver, Hartford, Houston, Las Vegas, Los Angeles, Miami, Minneapolis, Nashville, New York City, Orlando, Philadelphia, Phoenix, Pittsburgh, Portland, San Diego, San Francisco, San Jose, Seattle, St. Louis, Sacramento, Tampa, Washington DC Just in case you needed a few more reasons to get into Grubhub, here are some rave reviews: • “I love that I can order food while laying on the couch. Grubhub strikes again! !” - @DrFlunkenstein • “Thank god for @Grubhub. The delivery guy and I are going to be the best of friends” - @beatz6 • “Just when I thought I was ready to be an adult and cook, Grubhub” - @kima_jones • “@Grubhub is becoming VERY familiar with my food preferences. 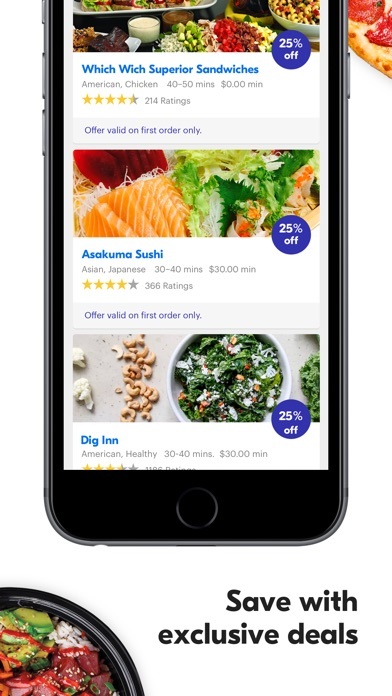 I love this app!” - @madelinedenise Free delivery terms: Must be a first-time Grubhub diner; offer limited to one use per diner. Order must be $15.00, before tax, tip and fees. Discount is capped at $5.00 off your order. Valid for Delivery orders only. I use Grubhub almost every single day. As of late, the app is getting worse and worse. Cash payment option is no longer available. The menu option to quickly navigate to certain portions by category is gone. It’s lead me to try other delivery apps. I am seriously disappointed. Also, why is there’s still no rewards system after all this time? An occasional 10% off a second purchase in one day is NOT a reward system. I’ve used GrubHub in the past online. Seems like these every company wants you to download their stupid app, so since I got the “$12 off” (I’ll get to that) coupon but had to download the app to get it, I decided I’d give it a shot. I found the restaurant I wanted and put 3 items in my Bag. I went to check out and apparently just having the dang app isn’t sufficient; they also want you to register. I’m already registered. They give the option to “sign in” using your Google account, which is connected to the same email they sent me the $12 coupon to, and yet it still prompted me to use an email and password (what’s the point of using oauth if you’re just going to ask me to login again? Come on devs. This is user authentication 101; you already have my email on file; asking to redundantly sign in is ridiculous). I can’t remember my freaking GrubHub password. It’s been a long time since I’ve used them. The oauth should be sufficient. Well, the stupid email/password login screen has no option to go back, cancel, or whatever. The screen got frozen with the page not even useable. I had to completely exit the app and restart it, which, of course, deleted the items in my Bag. This has been a huge waste of time. The $12 coupon looks nice on the surface but after they hit you with all of the delivery and “service” fees, combined with the expected taxes and tips, you’re not really saving much. So the app doesn’t function correctly and the redundant authentication is not only annoying, but has prevented me from even ordering my meal. Crashed the app and lost my Bag. This is stupid. It was a nice idea but I’m just going to go pick the food up myself and will be deleting this app. yall gave me the wrong order, i was really lookin forward to mine but i got somebody elses on accident. im pretty sure the other person paid more than me tho, i feel bad about that. Used the system. Arrived at the restaurant 15 mins after the pick-up time. The staff from the restaurant said the order from grabhub just came in, so we had to wait for another 30-40 mins. What is the purpose of using your service instead of calling the restaurant directly to order. It’s wasting our time! There is no point of using it at all. Extremely disappointed! The customer service is poor as well. The company doesn't show the right attitude to resolve this. Terrible as usual. Outdated. Wait times never accurate. Thanks for making us wait 2 hours until we finally had to cancel. Thanks for the 5 dollar credit I wont be using. Im done with your bad customer service, just your bad service in general. Half the time the menus arent even correct. I will be using uber eats or delivery.com from now on. Bye. Flat Rock’s food was just as amazing in the comfort of my own home! The delivery driver was on time and very professional! She was great!!! Great experience!! Like the subject line says, Grubhub tells you your order can be delivered by a certain time, but when there are delays, sometimes of an hour or even more, you can’t cancel your order. Lame. New app layout is terrible also the fact that restaurants just close randomly is a huge bug that should be looked into several times not I’ve just placed the order over the phone because a restaurant is showing as closed in the app as I go to checkout. the new app is unreliable and Grubhub customer care has really lost its way as well. I have tried several times on different days to order from my iPhone 8 and every time says please select required fields. I tried on another phone and same issue seen. This was so frustrating and waste of time. I have deleted app and I will never try again. No stars. Didn’t have a ton of issues until today. The wait for delivery was always really long and sometimes the driver or the restaurant forgot to include something, no biggie. However, I ordered today and waited almost 2 hours. I received a confirmation text AND email. When my estimated delivery time passed, I contacted the app via chat. A very helpful woman contacted the restaurant who claimed they never received the order. Ok, but even if they didn’t receive it, wouldn’t a driver have shown up to pick it up? I’m not sure whether to blame the app or the restaurant, but it’s just not worth it for me. Order arrived LATER than they stated! 1hr 40mins after I submitted it. 50mins past when they originally said it would be delivered. We ordered KFC from them and the order was missing 3 chicken pieces. Complained to support and they gave me a $5 coupon. Really? 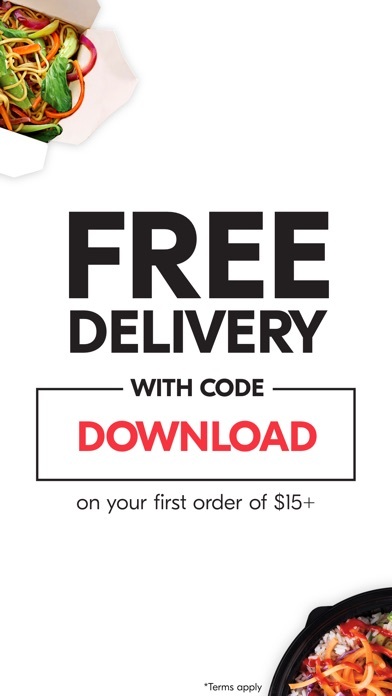 For a service that costs $8 extra per order? No thanks! You get that my order was missing stuff right? I only used it because I had a $15 off $20 coupon since the service cost half that. It was more like a $7 off coupon, which is still a good coupon. But it bothered me how expensive it was and that it took almost 2hrs to have someone drive 1 mile and pickup KFC for me. Use Uber eats or some other service is you can. Good representation of restaurants and good service. Good app & good results. Grubhub takes the longest to deliver food. Most my orders are over an hour for them to arrive from places that aren’t far from me. Not to mention they refuse to refund you for mistakes they make. Use another food delivery service not this garbage. Food delivery is really convenient when strapped for time, but it’s pretty expensive. The food price is raised, there’s a delivery fee & tip is required up front. Too many times I’ve received my food without a fork or napkin or the order is wrong altogether, yet I paid a nice tip in advance and overpaid for my meal and a delivery cost, only to be disappointed and frustrated. The tipping should at least be after the service is rendered. I don’t tip my servers before getting my meal, why should this be any different?? As I was putting in my promo code my order just shipped by itself. I am very upset because it said it took the $15 and then when I ordered it nothing was subtracted. This is my first using grub hub and I am very upset. I gave it only 4 stars because the food is usually cold or is beginning to go cold when it gets to me. But other than that it’s perfect I have had no issues so far and I’ve ordered at least 10 meals on this app. Not only do they shrug every time they forget to bring my drink, customer support is just as rude. The Grub hub app is easy to use, and the delivery actually came 10 minutes earlier than expected. The driver was polite, found our place (which isn’t easy), and the order was correct. 5 stars! If you want cold food and to make an annoying phone call, this is your app. DoorDash might seem fancier, but more than once we’ve ordered items through them only to find out the restaurant doesn’t offer what we’ve chosen. It’s happened enough that I canceled my profile with them. Never had a bad experience with GrubHub, and no I’m not getting any $ for this. Grubhub and Buffalo Wild Wings took care of a man who is being the bachelor tonight. Good job. Grubhub is my go to for when I don’t feel like going out to get something to eat. And will continue to be my go to when i want to order something to eat. First off, I’ve made over 30 orders from Grubhub. Fewer than 5 were on time. 5-10 were within 15 mins late, and the rest have been 20+ mins late. 4 of the last 5 orders were over an hour late. Yes, that means when they estimate an order will be an hour and 15 mins, it ends up coming 2.5 hours later... If this was for a party and you ordered hours early, then fine. Or if your lunch break is 4 hours long, fine. Other than that, the food is almost always way late and cold. Further, they add on all kinds of fees, making any order less than $50 be substantially more expensive. Save time and money by looking elsewhere. Set proper expectations by having accurate ETAs. Instead of the bait and switch / empty promises of promptness. Many of the restaurant menus provided by Grubhub don’t have certain items available or do not allow you to make changes for items that may have an ingredient that needs to removed. Other than that, it works fairly well. I would give Grubhub more stats if they have a better tracking feature within the app. This is my first time going through Grubhub. My sister couldn’t drive, so I decided to use Grubhub for my delivery... Grubhub! They are unable to respond to texts when they contact you directly and will not respond to emails they send as well. I would order food, wait over an hour, and then they’d send me a message saying they cancelled my order after waiting that long. This has happened on multiple occasions. Either cancel it sooner so I can find somewhere else to eat, or don’t have that restaurant as an option. I’ve spent a lot of money at Grubhub, but will now be taking my service to Postmates. They are more reliable, faster, and more polite. More restaurants with cash payment choice will be great . It’s truly my favorite food delivery app. 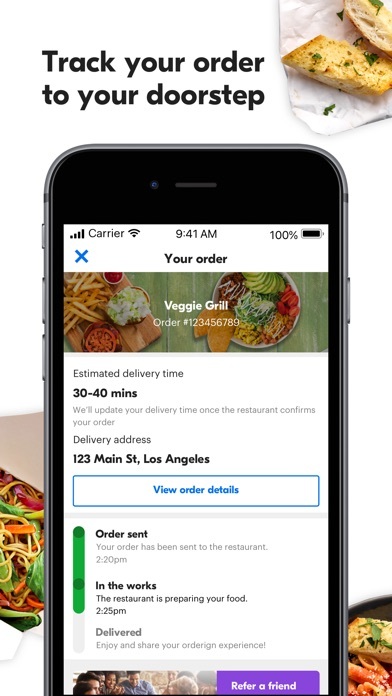 Always great options, super convenient for most of the places I decide to get delivery to, and I usually get my food quicker than the average wait times displayed on the app. So over Grubhub restaurants in my area. Either it takes over an hour or they are constantly not even available. Just say not available In our area. It’s very confusing ridiculous and disappointing!! !